We have relocated to Danang and plan to be here for several days. With a change in cities came a change in the tour translator/driver combo. 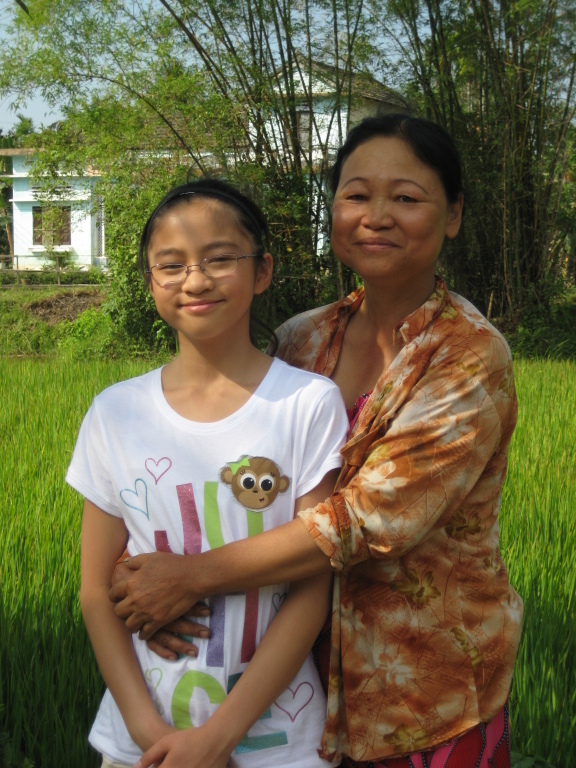 A bit of background: Mid last year, we wrote Marissa’s birthmother, Hoi, and told her we were planning to visit during Christmas break. But due to one life’s vicissitudes, our plans changed and we ended up sending a letter telling her we had to cancel. She was heartbroken. This past January we rescheduled the trip and we sent off another letter saying that we were coming for real this time, but this time we never got a response. 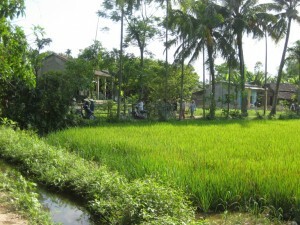 Flash forward to this morning when our new translator picked us up at the Danang airport and with her address in hand, and we headed straight out to the countryside for the visit. Unfamiliar with all the streets in Danang, the van stopped at the local gas station for directions. Unfortunately, the station attendant herself had no idea where the street was. She was however, kind enough to point us toward a gentleman at another business down the street that might have directions. That gentleman ended up offering to take us there personally. With our translator on the back of his scooter, we followed in the van. With each successive turn, the roads got narrower and narrower. And foliage got thicker and thicker. Off an alleyway, the road, if you still could call it that, was the width of a bike path and the van had to stop and turn around while the scooter continued off. Up ahead our guide asked the locals for the whereabouts of Marissa’s birthmother, initially having some confusion because she didn’t go by her formal name in the neighborhood, but eventually he had success in finding her. 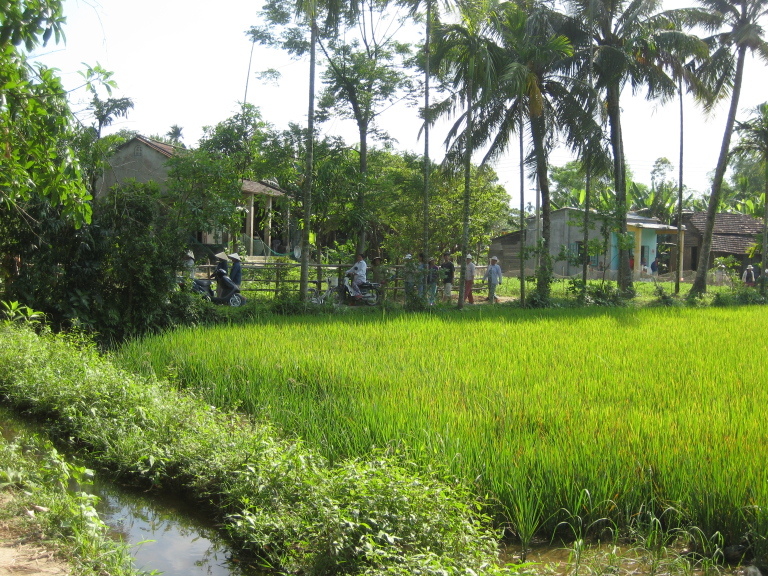 In the distance, across a rice paddy, he motioned for us to follow the path on foot and about the time we exited the van and headed down the path, a spry woman in her mid-50s started heading up the path towards us. She headed directly towards Marissa and gave a big hug to a girl she hadn’t seen since she was a month old. 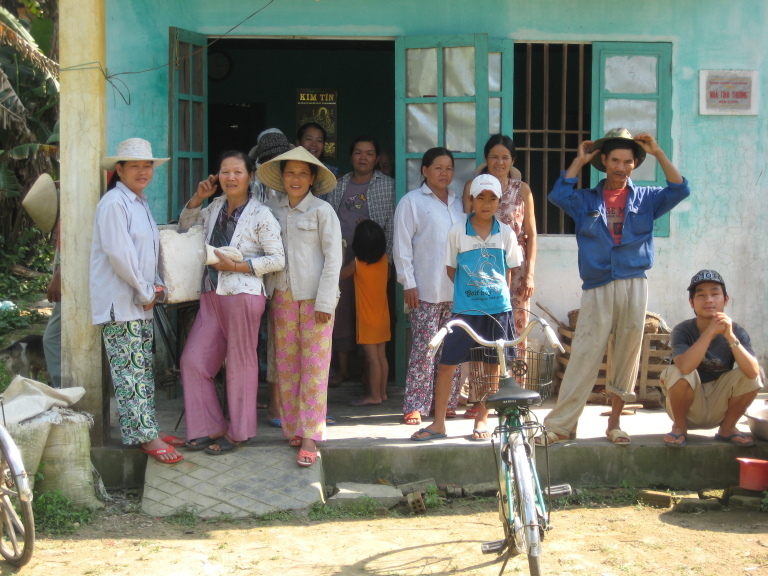 Hoi, the translator and the three of us gathered back at her house, a cement block home with a corrugated tin roof about half the size of Marissa’s bedroom at home. 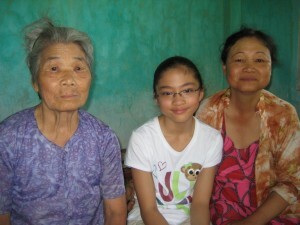 Marissa sat on Hoi’s bed between her birthmother and birthgrandmother. All three of them were in tears. Hoi checked Marissa’s teeth and squeezed her legs to see that she was indeed healthy. Hoi offered us bananas and brought out all the pictures we had sent over the years. Within a few minutes everyone from the neighborhood had gathered on the front porch peering in the open door and window. She also had pictures to share from her son’s wedding last November. We had really wanted to meet Marissa’s brother who is fifteen years older but unforunately, he lives 400 miles away and the trip is 12 hours each direction by bus and is not workable into our schedule. Ri was willing take the overnight bus trip to meet us in Danang if we could reimburse him for the bus pass. We, of course, said yes immediately and so we’ll see him tomorrow afternoon. We ended the meeting with a walk outside for pictures of the two of them together. Hoi made hand motions that Marissa is almost as tall as she then proceeded to lift her 88 pound daughter up off the dirt. Hoi walked us up the path back to the van and we said our goodbyes for the day. Despite our attempts at a letter, this was all a complete surprise to her. The hollow were Hoi lives is so remote, it does not get mail service, so she has to make a trek to the post office miles away to pick up what little mail is ever addressed to her. She has arthritis and cannot read, so her trips are understandably sporadic. She never received our letter from months ago, and in I all likelihood it is still at her local post office. We are gathering information to do a search for our younger daughter’s birthparents in China. 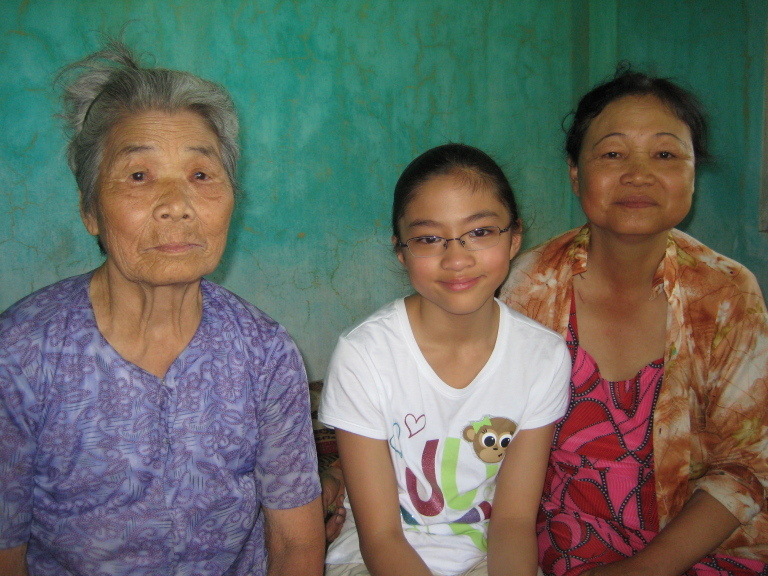 There are few resources for learning how birthparent reunions might go in Asia, so I am especially thankful that you shared this story. And this is a post I’ll never forget. This is even tearful to read about. Aren’t you so glad you decided to take the trip? Of course you have a picture of the reunion to share when you get home? Vietnam is 11 hours ahead of EDT. In your morning, our day is just ending. In your evening, it is our morning of the next day. Wow, Ken. What an incredible story! Thank you for sharing this. Marissa looks exactly like her birth mother in these pictures. This sounds like an emotion-testing trip for Marissa. I know that I would never, ever be able to do anythng like this. Wow. Thats just incredible on so many levels. I agree with Marissa, she wont EVER forget that day. Wow. I’m just flabrgasted. What a great suprise for Hoi too! Im so glad that you were able to take Marissa on this trip in her lifetime. And for Marissa, keep in touch with me! i want you and your family to come ver to Tipp City this summer and come swiming at our city pool!